If you can only see one movie this year, make it Moonlight. With most movies, we go with the purposes of either being entertained or enlightened on a particular issue, sometimes both. Moonlight transcends both of those purposes. It is an urgent, important, and timely film that presses the viewer not to understand its characters by their race or sexuality, but by their personal experiences that mold them into the men that they become. Moonlight not only deserves to be seen: it is essential. 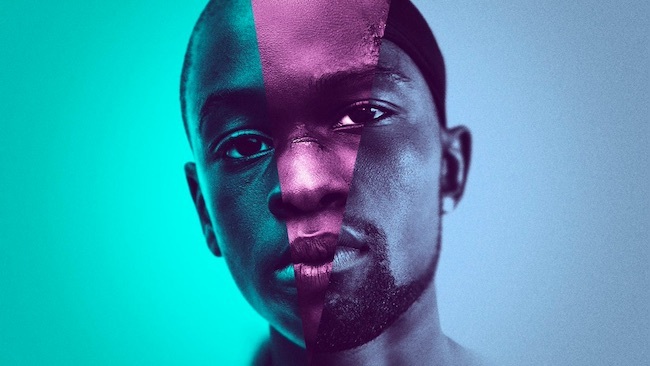 Broken up into three parts, Moonlight follows a young man growing up in an ugly urban neighborhood that doesn’t care much about the people that live in it. This man has been called many things during his childhood. Little. Black. Chiron. One of those is his name. All of them define him. Chiron has had a hard childhood. He was bullied when he was in elementary school. He watched his mother sink into drug abuse with a new man she brought home every night. He witnessed the drug trade up close as he lived with a dealer when he ran away from home. In high school, bullying further intensified as all the “hard” kids intimidated Chiron because of his small size. His mother’s abuse intensified. His loneliness grew. He fell in love with one of his classmates. He was assaulted on school grounds. And in experiencing the pure essence of hurt and anger, Chiron makes a great mistake that costs him much. We see him sink deeper into this despair that we call life. Now in adulthood, the older Chiron is starkly different from his younger self. He now deals drugs himself, but he never uses them, fully remembering what it did to his mother. He worked out, got hard, built himself up so that he would never be intimidated by others again. He carries a gun on his waist, gold chains on his neck, and a chip on his shoulder everywhere he goes. Before I praise anything else in this film, I have to praise the casting. With most movies with flashbacks, the casting isn’t paid much thought when it comes to the younger counterparts. In Batman V. Superman, for instance, the young actor Brandon Spink looks nothing like the elder Ben Affleck, from his bone structure all the way to hairstyle. In last year’s equally failed Fantastic Four, the young Evan Hannemann was chubby and round-faced, looking nothing like the slender, more robust Jamie Bell at an older age. It’s a small element but it’s a noticeable one, and most filmmakers choose to overlook it since the younger actors are in the film for less than 10 minutes. But Moonlight is not like most movies. In this film, it is written and divided into three parts, with each act resembling a different time and age of Chiron’s life. Because of this, the casting is so crucial, to the point where if it is unbelievable even for a second, the entire film can fall apart. But the casting in all of the roles are pitch-perfect. None of the actors falter for a second, and it’s at times hard to believe that these are actors that we are watching. Even child actor Alex Hibbert does such a good job expressing the younger Chiron’s innocence and vulnerability. He embodies everything a child is supposed to be: playful, excited, energetic, but also confused, shy, fearful, and sometimes, intimidated. The scenes where Hibbert had to react to his mother’s drug abuse were especially hard, because he just stands there frozen, petrified, unsure of how he’s supposed to react to his mother’s outbursts. It’s a simple role, but one that’s brilliantly filled. Even at such as young age, Hibbert demonstrates a talent that I hope grows as he becomes older. The other actors are just as great in their performances. Ashton Sanders, who plays the same role in high school, physically resembles his younger and older counterparts, and appropriately identifies with the confused, awkward hormonal period all teenagers go through at his age. The most convincing performance, not surprisingly, belongs to the experienced Trevante Rhodes, who portrays the older Chiron as a broken fragment of himself, trying to piece together his childhood and understand why things happened the way they did. Any one of these actors can be nominated for an Oscar, SAG, or Golden Globe, but if it’s even one actor, it’s an unfair nomination. All three actors need to be recognized, because all three brilliantly portrayed their characters at different, chaotic, messy times in their lives. This film is directed by Barry Jenkins, who before Moonlight hasn’t made a feature-length film in eight years. How can this guy be out of the director’s chair for so long and come back and make such as minimalist masterpiece as this? I think it’s because he tried to relate the film on a human level as opposed to a technical one. Look at Chiron’s older self. As a man, he identifies with numerous minority communities that are, as of late, facing discrimination. The African-American community. The LGBT community. The American lower class. For one reason or another, each of these communities have been seen in a negative limelight by parts of our culture either due to current events or moral debate. The reason why you need to see this film, even if you end up hating it, is because it forces us to think differently from what we’re used to. Chiron commits many wrongs in the film, most of which we might not agree with. But we at least understand where he is coming from and why he behaves the way he does. He might be seen in the wrong, but he is also seen as sympathetic. After all, when a kid grows up in a broken household, neglected by his family, hunted by his community, and emasculated by his peers, do you blame him for coming out a little more confused about life rather than more clear about it? By the end of the film, we see Chiron for all that he is. Black. Gay. Drug-dealer. Felon. Flawed. We see him as all of these things and more. Yet, under the calming blue hue of the moonlight, we also see something else: that he is still beautiful regardless.